A few days ago I made the argument that “we need a carbon tax” because global warming is real and our response to it should not be defaulted to regulatory action by the EPA and individual states acting on their own. Just two days ago the U.S. 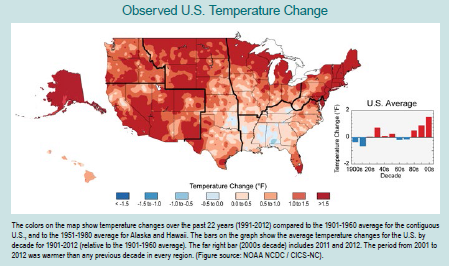 Global Change Research Program released a voluminous new report, the “Third National Climate Assessment”, giving many examples of how dramatically global warming is already affecting life in the United States as well as all over the world. Perhaps the most direct effect in the U.S. is an increase in average temperatures of almost 2 degrees Fahrenheit since 1900. This means that summers are longer and hotter and that winters are shorter and warmer, on average. Hotter temperatures mean that there is more moisture in the atmosphere and rain comes in heavier downpours. It is going to be harder and harder for doubters to deny the accumulating evidence. 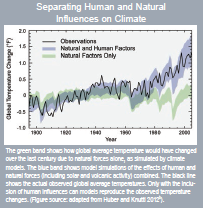 Global average temperatures have also increased by almost 2 degrees F in the past century. The most dramatic, and visible, evidence worldwide for climate change is the shrinking of the artic polar icecap measured each year in September. 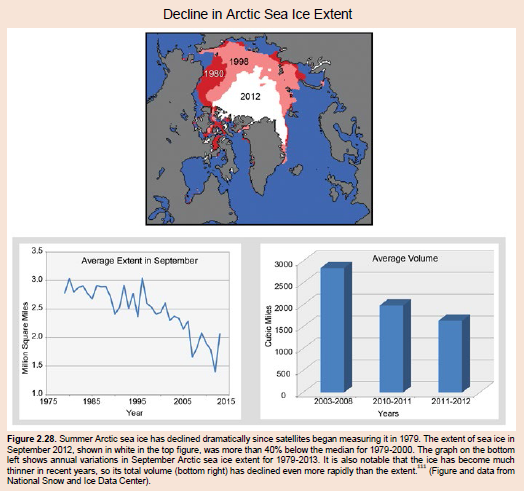 Although the ice extent fluctuates from one year to another, the pattern of decline, as shown below, is clearly evident. A worldwide response is urgently needed and the wealthiest country in the world should step up to the plate and lead the way. A carbon tax does not mean an end to using to using fossil fuels but simply provides a strong incentive, without government picking winners and losers, to cut back on carbon emissions. We can be confident that, with a strong economic incentive, American technology will figure out how to remove carbon from fossil fuels during combustion. The sooner we begin a program along these lines, the better off we will all be in the very near future as the world continues to get warmer. This entry was posted in carbon tax, climate change, coal, fossil fuels, global warming, Jack Heidel and tagged Carbon tax, climate change, fossil fuels, Global warming, jack heidel by jackheidel. Bookmark the permalink. Jack, while neither agreeing or disagreeing with your premise, I would caution that the issue of global warning and all its accompanying issues will not be resolved until there is an adequate body of information that is gathered and reported by a recognized and accepted national body that is perceived to be both alarmist and bias free. And that fact is that a carbon tax is viewed as it is: simply another tax. And we know from our experience of many years that a tax for whatever noble cause is not always viewed similarly by the payer of the tax. With the example of Al Gore and his own carbon footprints that seemed to claim ‘follow my advise but not my actions’ along with the failures of such presidential pet projects as Solyndra most people are cautiously waiting for more empirical information that they can both digest and accept. And sometimes the machinations of scientist do not quite meet the level of what a taxpayer can either digest or accept. The primary problem with the evidence presented to date is that it covers such a short time period in the much longer history of the world climates. And there remains little in evidence to establish that the last half century are unique since the last ice age of 11,000 years ago. Unfortunately, with the actions of such sometimes rouge agencies like the EPA, special interest groups that constantly warn of the immediate demise of civilization, and the politicians who accept without question both the actions and the campaign donations of those groups, the average American has few real clues as to what is truth and what is hyperbole. I sometimes compare the climate issue with our current state of education in this country. What have we received for the tax money that has been invested over the years since Eisenhower’s National Defense Education Act and the building of larger and more equipped schools for an increasingly disinterested student population (as well as non-participating parents) and what will be left after an even more activist EPA uses continuing rising budgets to decrease the very sources of power that runs the schools and the industries of this nation. In both cases, the increasing expenditures may not have produced the results that should be expected from the amount of tax money spent and sometimes have not even approximated unvoiced goals of finding acceptable working solutions for the good of all and not for just a few favored voices enabled by a sometimes passive press and normally passive politicians who are constantly in campaign mode. In the end, the question of global warming and climate change will not be resolved until we can establish a national body of learned individuals who have shown over the last 10 years that they have no interest in the current debate as to favoring one side or the other. The members of that body should include believers and doubters as to global warming and as individuals they should have a known quality of reasonable discussion and compromise. And they should be able to question and ask for clarification of any evidence presented for their review as well as being able to force either side of a related issue to determine where there can be compromise and work toward that end. A solution as to action and resolution would seem to be far better than a carbon tax that would be like so many other taxes: Lots of expenditures that end up not attaining reasonable and reachable goals, but do produce even more calls for more taxes. The graphs and charts which I have presented above are based on observational data by distinguished scientific panels and I think that we have to take it at face value. The dramatic trends being reported are, as you say, only for the past 50 years. But I don’t think we can afford to wait another 50 years, say, before we take it seriously. The Miami area, for example, is already beginning to have problems from rising sea levels. Granted that a carbon tax will not be well received by the general public. But I consider this to be the least onerous significant action that society can take. A carbon tax is much preferable to having the EPA setting arbitrary standards for coal burning power plants. Let the market figure out whether or not it remains economical to burn coal and whether technology can reduce the amount of carbon emitted when coal is burned. The most credible skeptics, like Bjorn Lomborg and Matt Ridley, do not deny that there is global warming, but rather are saying that we need a rational plan to address it. We’ll have to develop such a plan through the political process. It would be way too risky to try to identify a panel of independent and incorruptible thinkers and let them figure out what needs to be done. Thanks for responding to my post. Let’s continue the conversation!